Say goodbye to your innocent childhood vision of multi-colored Space Invader bugs dancing happily across the sky. Character artist Tom Carruthers would like to replace it with a fang-filled piece of fleshy nightmare fuel. 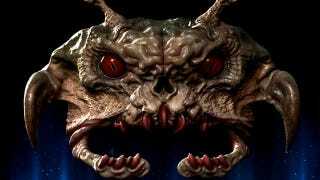 I have to admit, Carruthers "realistic" Space Invader looks a lot more like an acid-spewing enemy you'd want to kill with fire. But in my heart, I'll imagine them as giant versions of the 2D sprites, just like they were on Futurama.